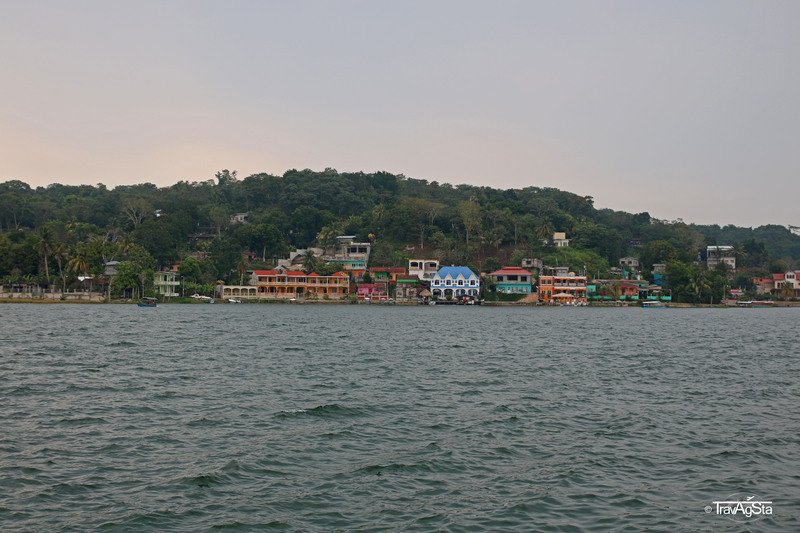 Guatemala – a lot of Tikal & a little bit of Flores! 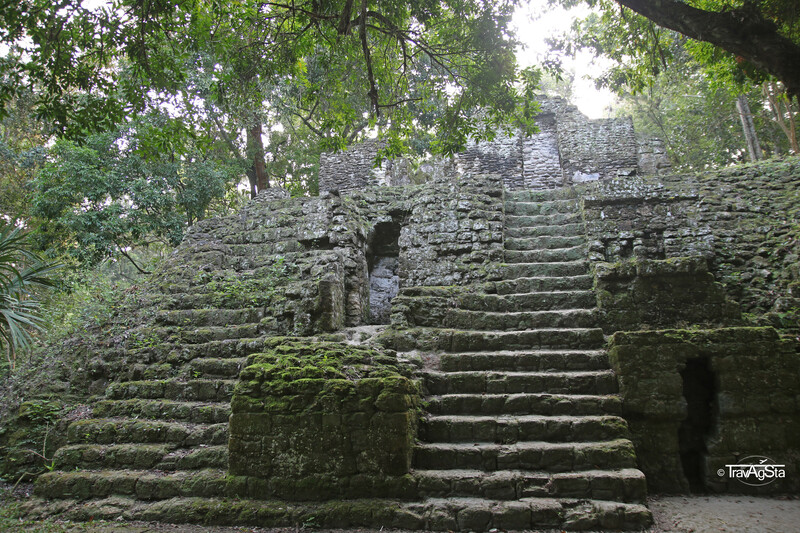 When thinking about Mayan ruins, first names coming to your minds are probably Chichen Itza and Tulum. But the former Mayan Empire reached further than that. 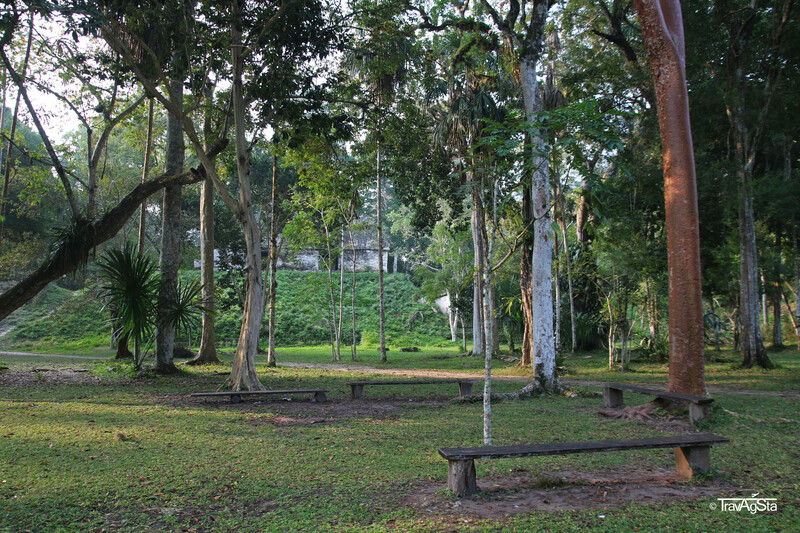 Many people don’t know about the Mayan ruins in Tikal. 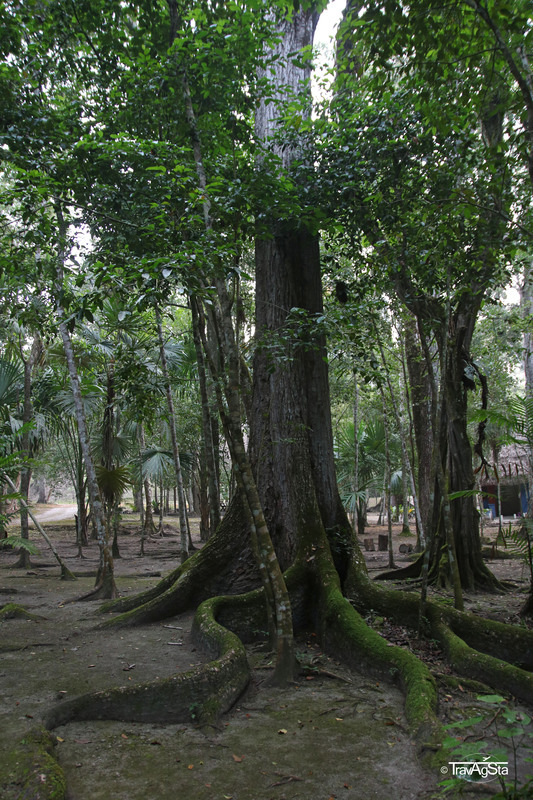 And even if they do, the trip into Guatemala’s rainforest might not be worth the effort for most travellers. 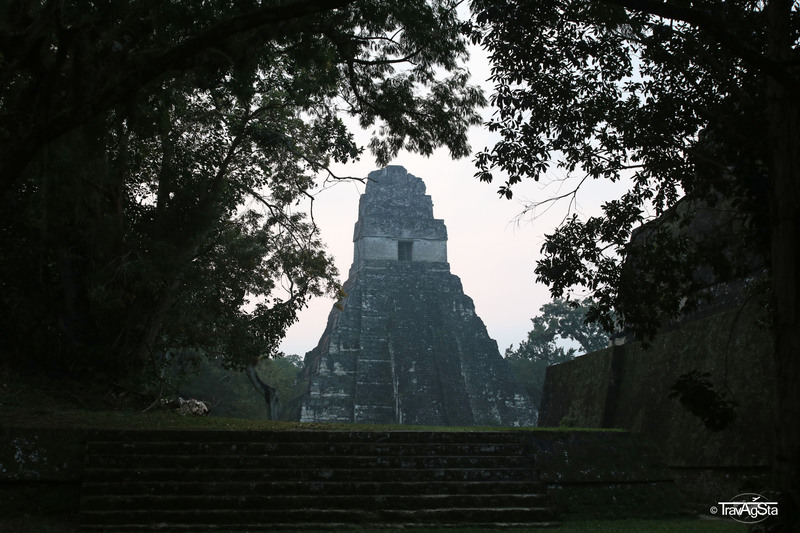 Tikal is the name of the National Park in Guatemala’s department El Petén as well as of the Mayan ruins. 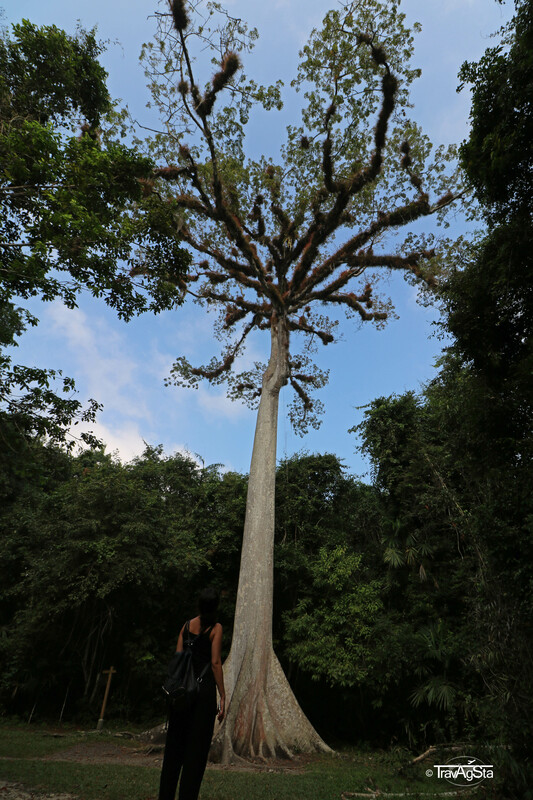 It’s part of the UNESCO World Heritage as well as the natural Heritage. First signs of settlements date back to 900 B.C, becoming more important in the 2nd century. During that time Mayans started to build temples and palaces. Between the 5th and 9th century the city had several peaks and lows. 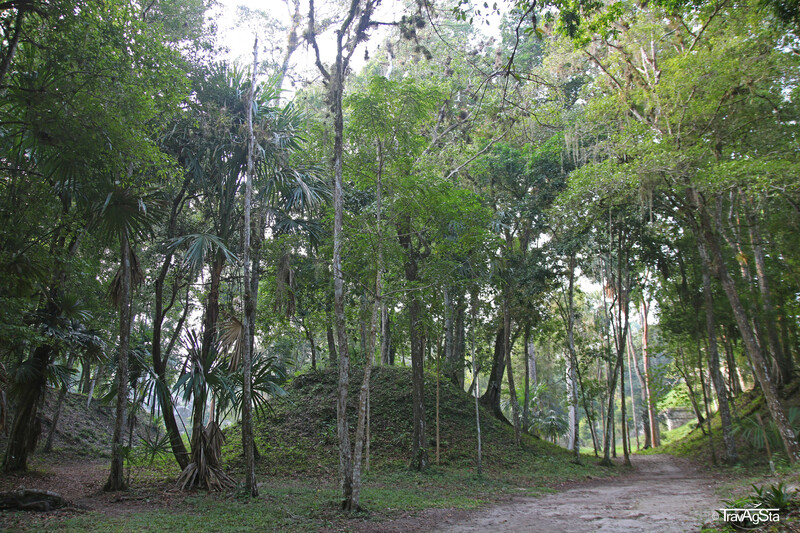 After the 10th century, Tikal was almost abandoned. Well, so much for the hard facts which you can all look up at Wikipedia. 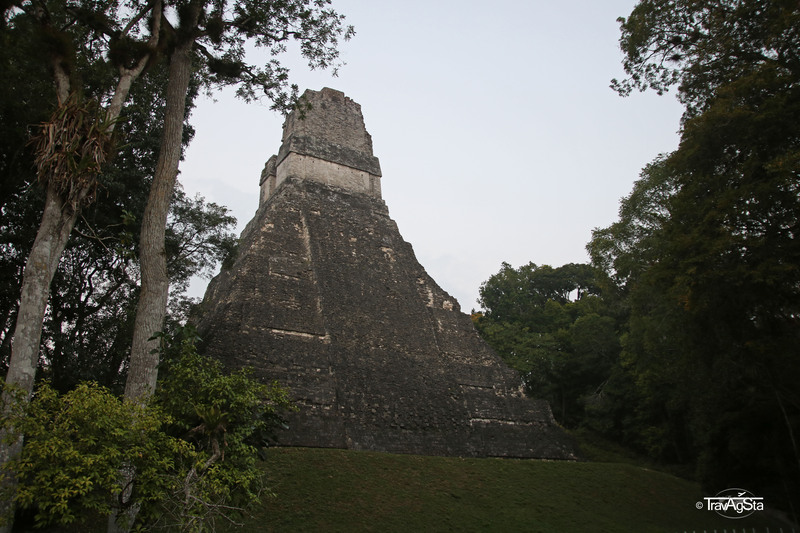 Of course, the hard facts didn’t convince us to visit Tikal alone. 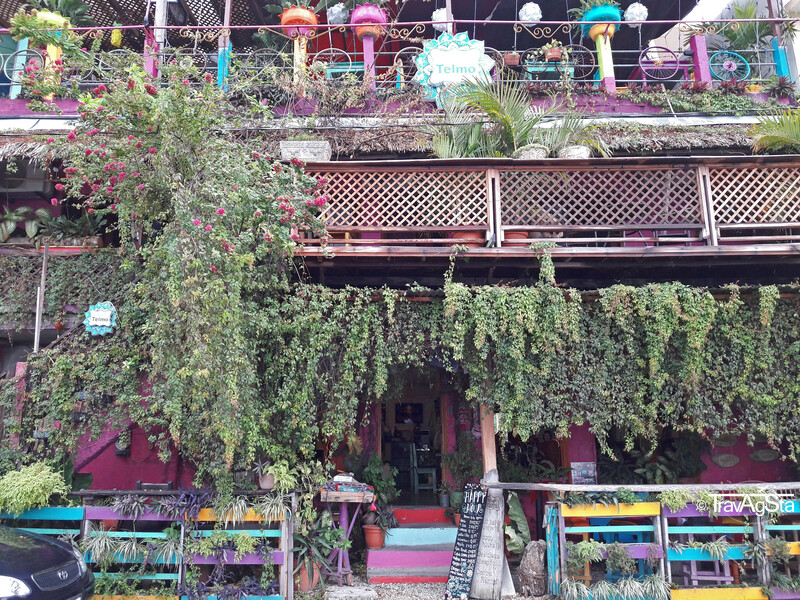 There are definitely more comfortable things than taking the boat from Caye Caulker to Belize City and then the bus to the jungle of Guatemala. (more about that in our upcoming itinerary). 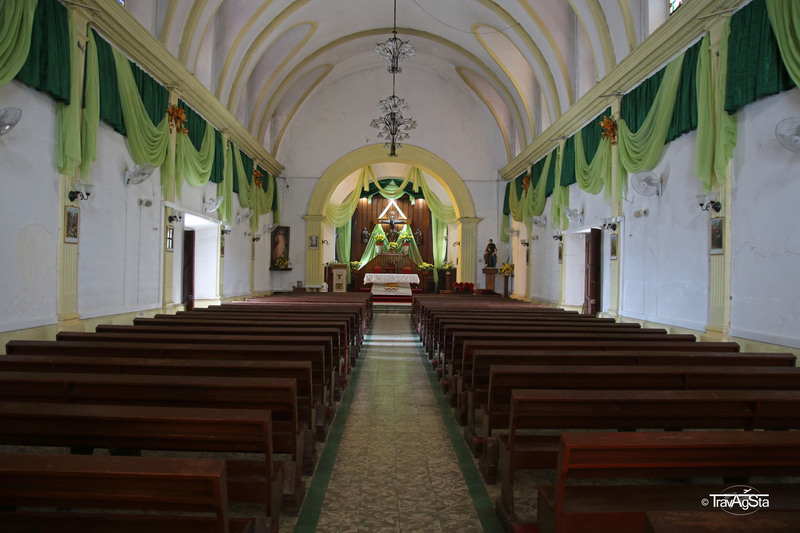 It was the whole package that’s expecting everyone there: The combination of old, grey temples (a friend of us used to call such places as ‘just a bunch of rocks’) surrounded by thickly wooded green and the screaming of howler monkyes that call the jungle their home. It felt like Angkor Wat in Cambodia, just without the crowds, but with more jungle and animals. There was no electricity after 10 p.m. which increased the adventure factor. Jan once left the room at night and told me, he never saw such a clear and starry night. Before our alarm clock rang at 5 a.m. (at least two more hours of sleeping), we heard the screaming of the howler monkeys right in front of our door. Those beasts are extremely loud, especially around sunrise. 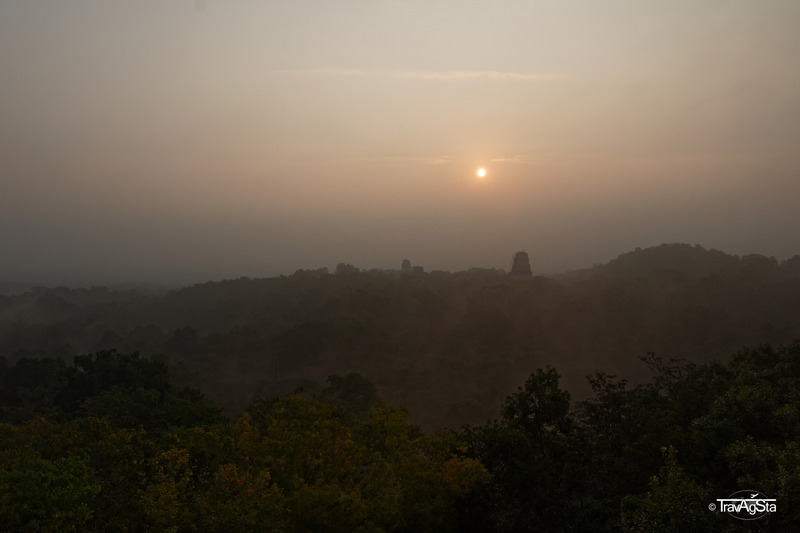 ‘No pain, no gain’ – this came to be true once again: We started walking from our hotel in the semi-dark with a flashlight, surrounded by the screaming of the howler monkeys and other animals. 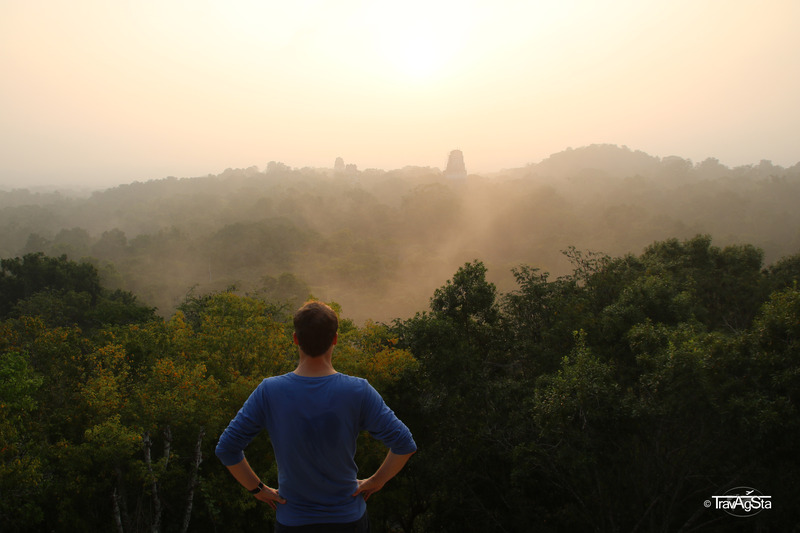 We really wanted to see the famous sunrise seen from Temple IV. Afterwards, we can’t tell whether animals accompanied us or if they were far away from us and just really loud. The sounds we heard, indicated the former. It took a whole 20 minutes to reach the main square which we had all to ourselves. We really thought there were more people here around that time. There was already some daylight but the sky was covered by fog. This was reason enough to stay for a while here. I don’t want to be cheesy, but having jungle temples for your own has something magical. It was a once in a lifetime experience. Despite the signposts, it wasn’t easy to find Temple IV. The temple area is really huge and with so many trees you might not see the temples. Thanks to the fog we didn’t have to hurry too much. After walking around confused for ten minutes (it seems like understanding the signposts in the morning is an art indeed) we stood right in front of Temple 4. At the same time the sun came out and we ran up the wooden stairs unreasonably fast. Don’t do this at home, kids! It was dangerous and stupid the same time. On top of the temple, we met two groups (the first other tourists in the park) that came with guides waiting for the sunrise. Most were just sitting silently and staring over the jungle. The exhausting start and lots of sweat (from fear, jungle and the stairs), being tired and hungry – all was forgotten soon. The sunrise view over Temples I, II and III was all we wanted and we got it. The two groups left soon and we were all alone up there. 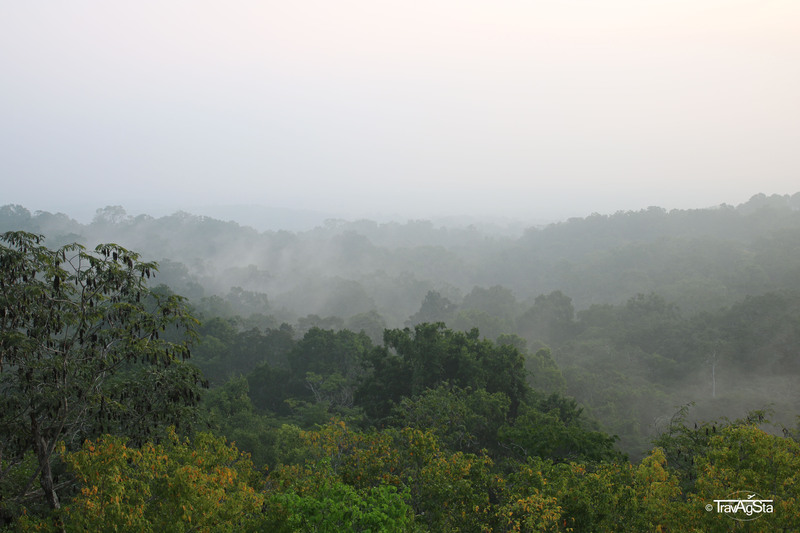 The screaming of the howler monkeys and the disappearing of the veil of mist were then the cherry on top. I hope this doesn’t sound too cheesy, but it was just perfect! 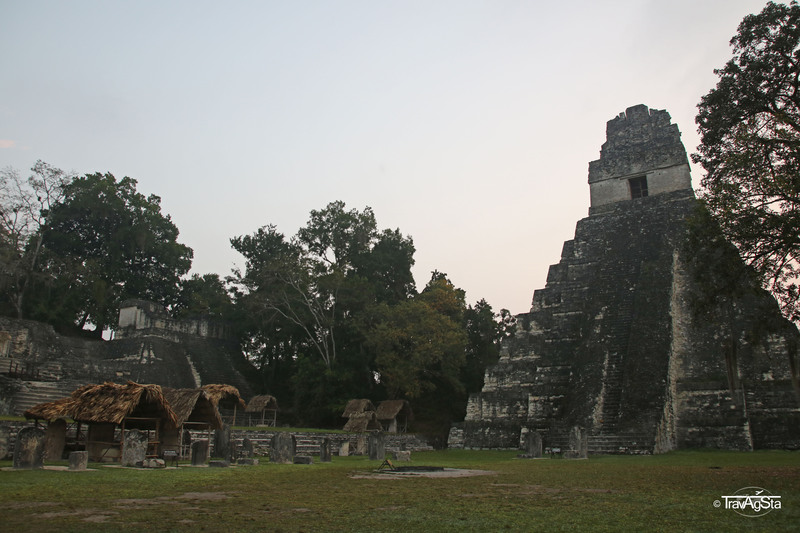 If you’re familiar with some of the pictures: George Lucas chose Tikal for his first Star Wars Episode IV and the latest movie ‘Rogue One’ as setting for the rebel’s hideout. Just so you know. Definitely in the morning. Even if you didn’t want to see the sunrise, you should leave early. Book a hotel in the jungle and start early. First of all, you will have the whole place for yourself. The morning light provides a unique atmosphere; the screaming of the howler monkeys is just insane. Secondly, temperatures are still agreeable. Don’t underestimate the heat and the sultriness. 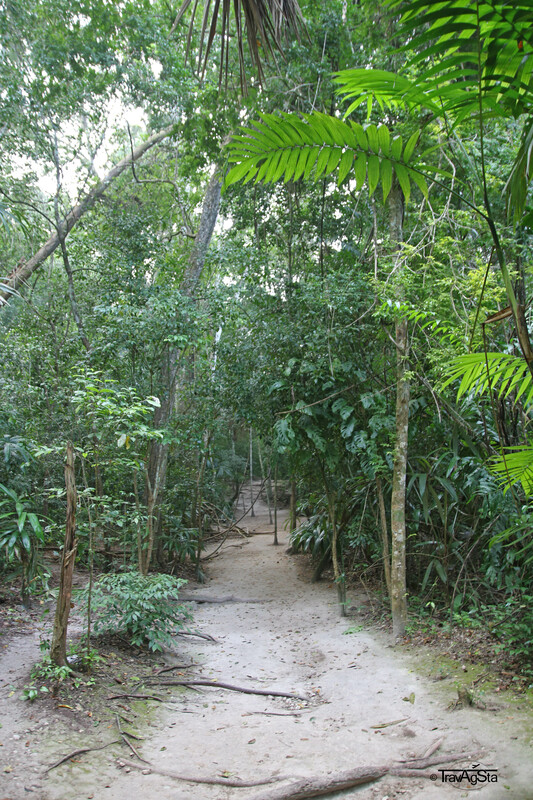 The walk in the jungle at 6 o’clock in the morning wasn’t easy at all. I don’t want to know what it’s like later the day. We can’t tell a lot about the sunset as we arrived too late the day before. 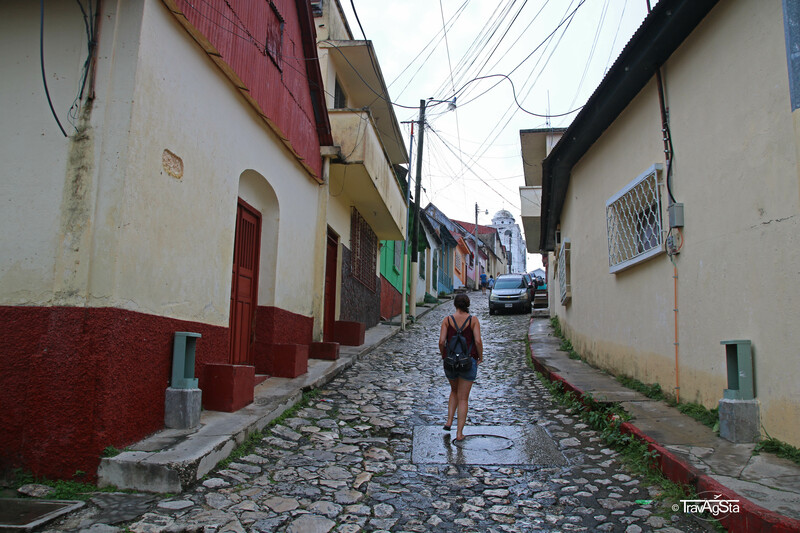 Travel times in Central America shouldn’t be taken too seriously. Tikal with or without a guide? The answer to this question isn’t easy. We decided to not take a guide. First of all, we wanted to be alone and explore the area on our own. Secondly, we generally inform ourselves before and the amount of information is enough for us. We recommend a guide if you’re afraid of the dark. It takes a while until your reach the temples. We wouldn’t have got lost with a guide, but we had so much fun in doing so. It wasn’t bad at all. 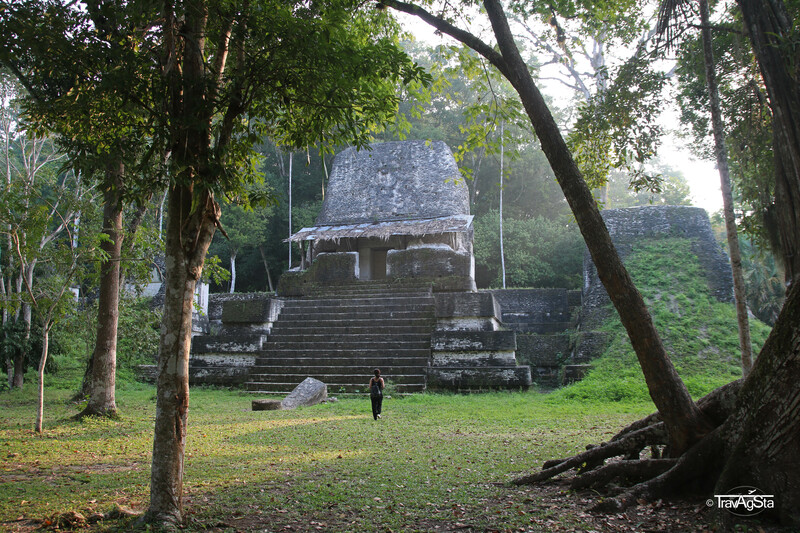 Furthermore, we would recommend you a guide, if you wanted to have detailed information on the temples and the animals in the jungle. 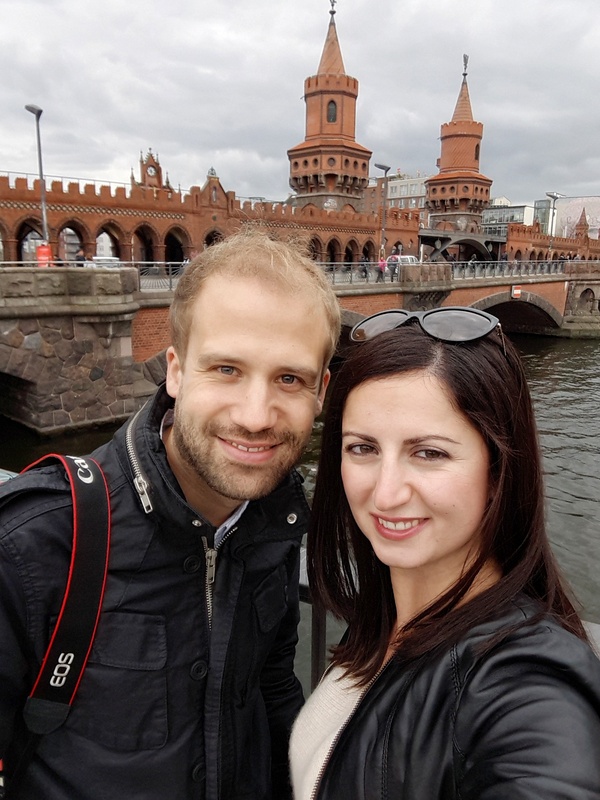 Avoid a guide if you don’t want to be surrounded by a large group with lots of selfie sticks. 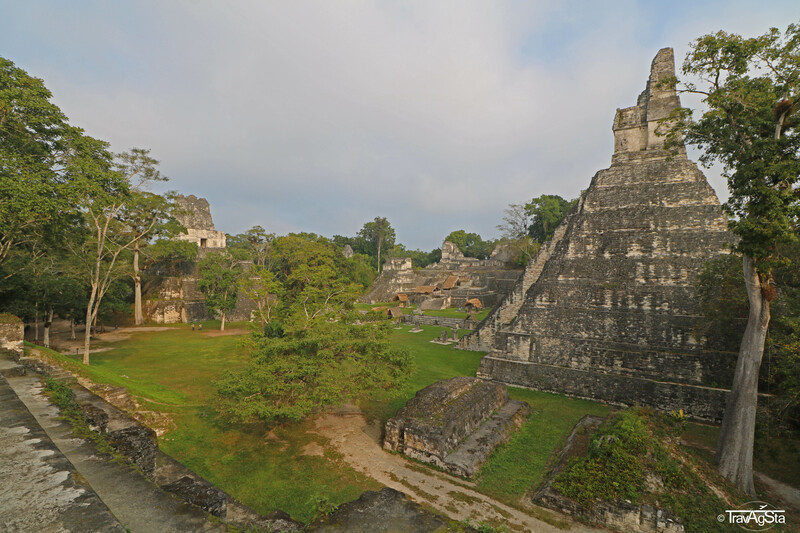 Well, this is not too relevant, as there were strangely few people in Tikal. Maybe we were just traumatised by the hords of tourists in Tulum. We already recommended staying in the National Park overnight. If you arrive after 3 p.m., your ticket will be valid for the next day. If you arrive earlier, you will have to pay twice, even if you just want to go to your hotel. Entry to the National Park is 150 Quetzal (around 22$) per person. This is a lot for Guatemala. But the money is well invested. If you want to see the ruins before 6 a.m. or after 6 p.m., it will cost you 100 Quetzal more and you definitely need a guide. In our opinion, this is not necessary in January as sunrise and sunset were withing opening hours. Thrilled by the jungle temples we left Tikal around noon and headed to Flores by bus. 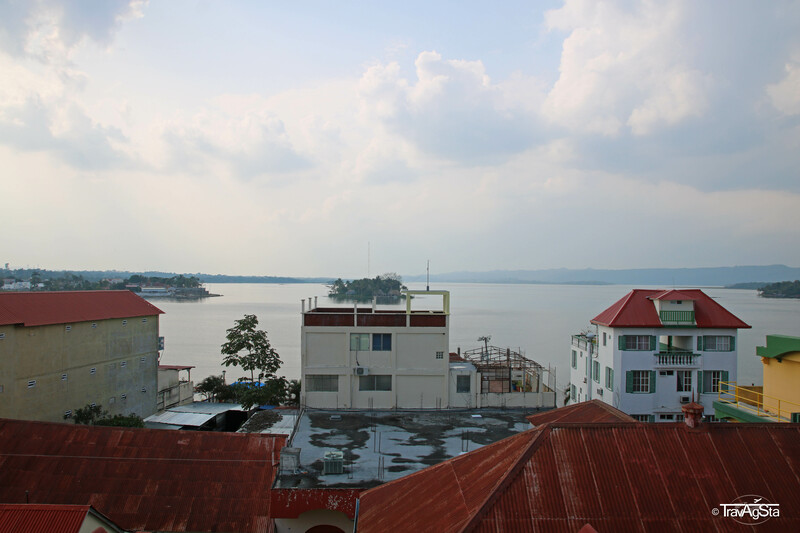 Flores is the capital of Petén and is situated on the island San Andrés in the Petén-Itza Lake. It’s connected to the mainland by an artificial dam. Unfortunately, we weren’t lucky with the weather there. After a heavy rain, it became quite cool. 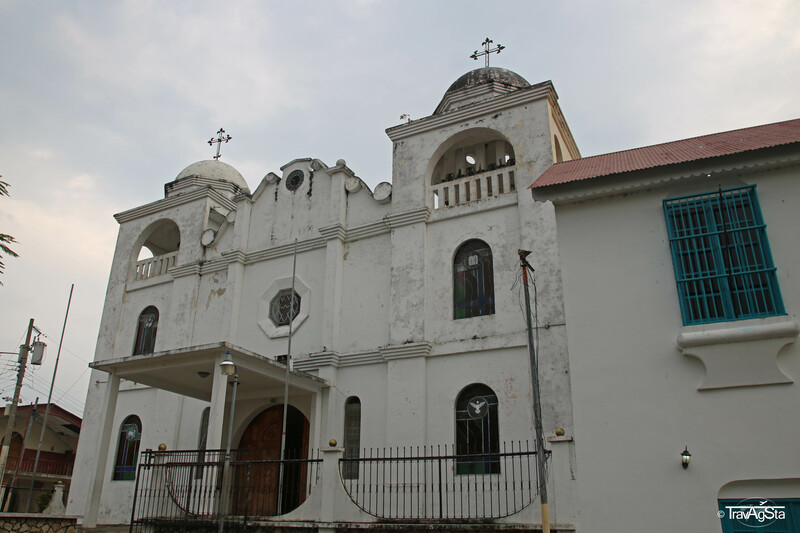 Nevertheless, we hit the road to see the Colonial City. The city itself doesn’t have much to offer in terms of classical cultural sites. 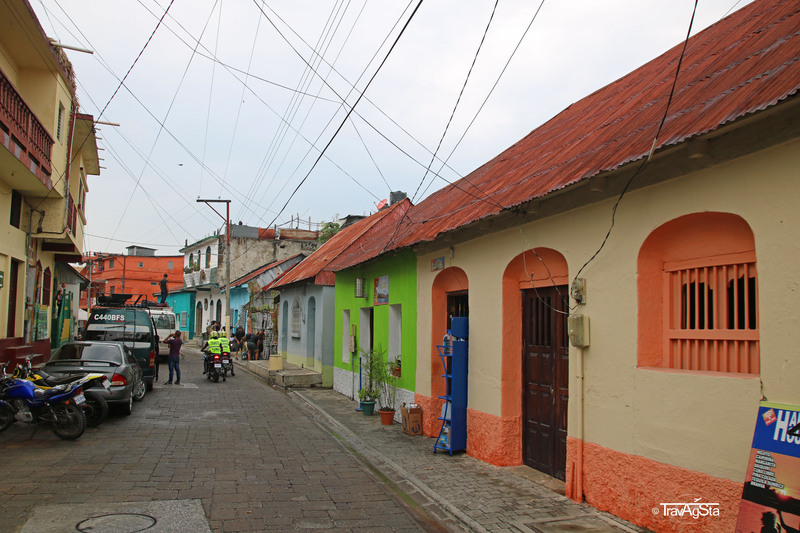 The cathedral was ok, but the colourful colonial houses were definitely more interesting. In general, we have a thing for colourful houses. 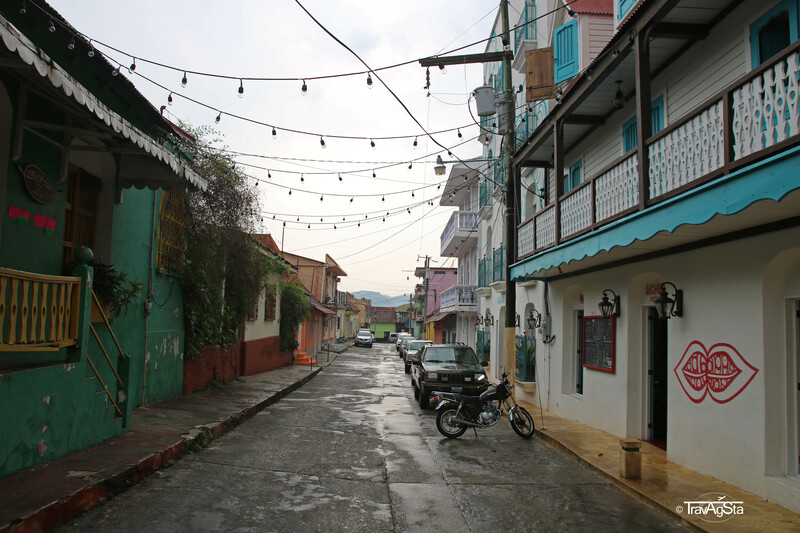 (like The Alsace in France, Bo-Kaap in Capetown, Willemstad in Curaçao). On sunny days, people go swimming and have a lot of fun. At least, that’s what Instagram told us. This was obviously not the case on a rainy day. 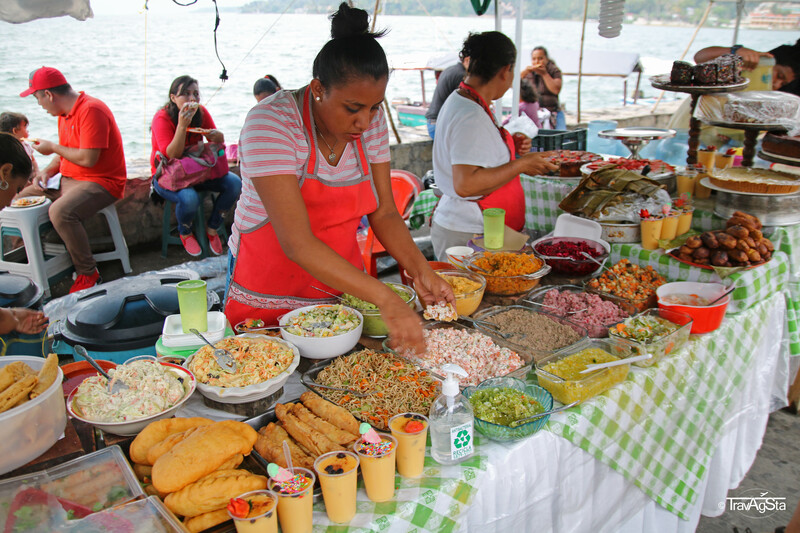 What we loved the most here was the food market ‘Las Mesitas’: Every evening, cheap, delicious. As everyone likes tasty food this is our recommendation for everyone in the world. 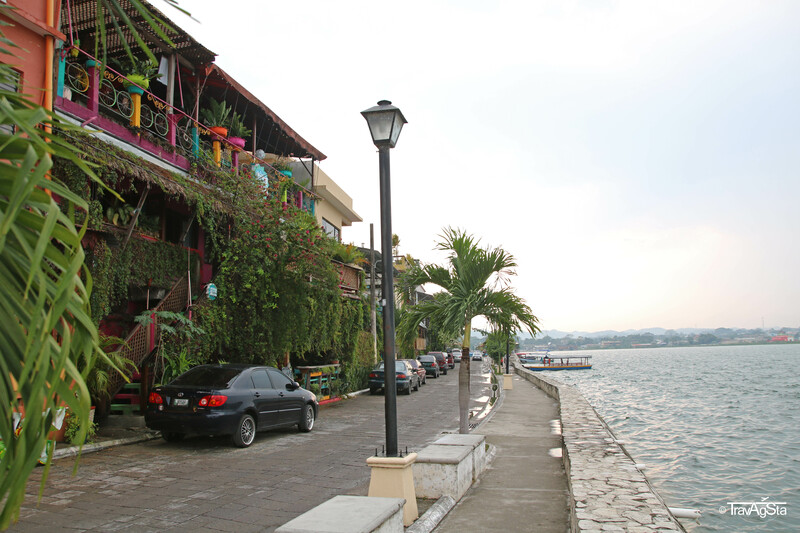 A lot of travellers use Flores as their base to make trips to the surroundings. 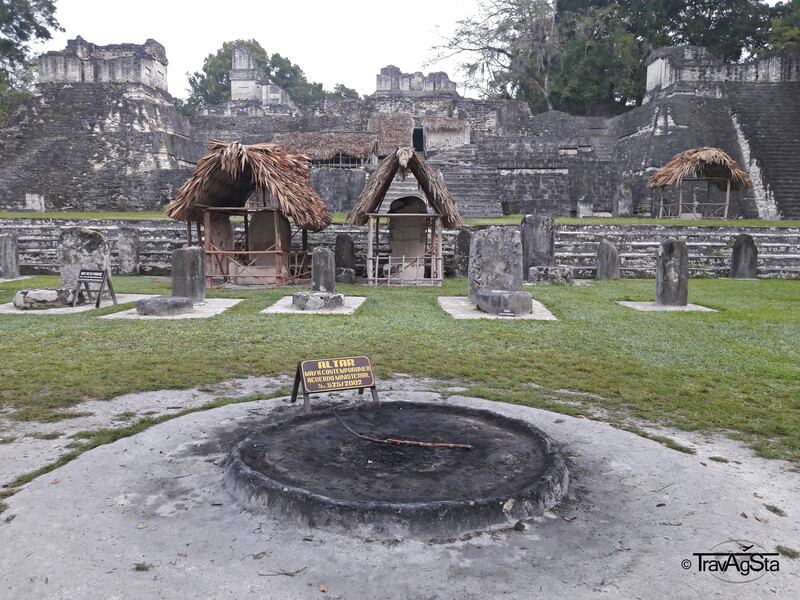 If you don’t want to stay overnight in Tikal, this will be your choice. Just keep in mind you have to hit the road at 3 a.m.
We’re totally excited about Tikal. 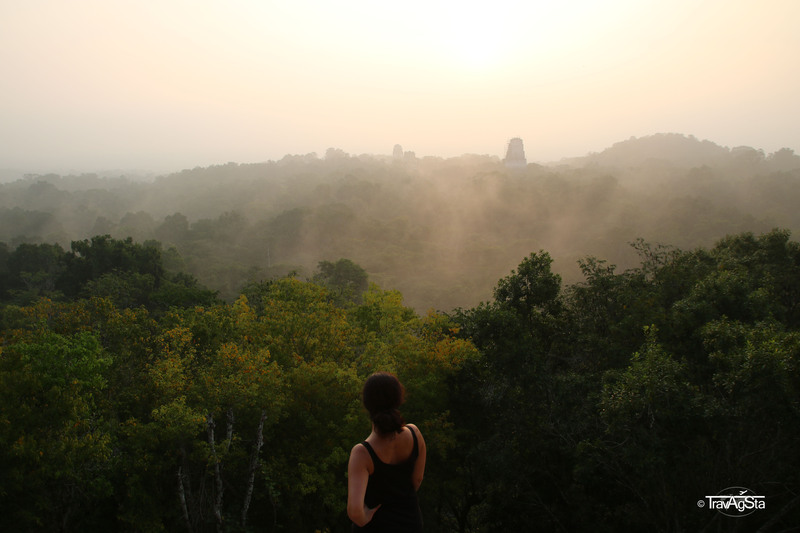 The jungle, the temples, the mystic atmosphere in the morning and the howler monkeys – I wonder if we’re ever going to experience something like this. We’ll see. Flores is quite nice but a bit boring. Maybe we would tell you something different if we had better weather conditions. 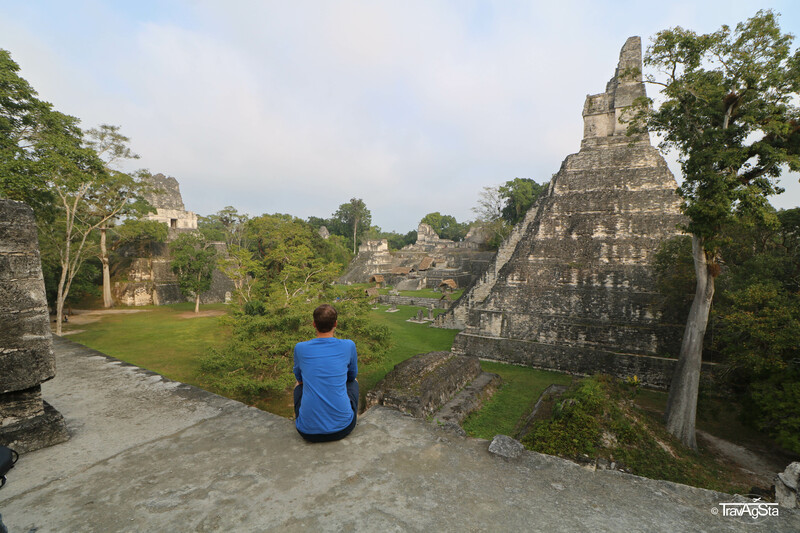 Are Tikal and Flores on your bucket list? Stellenbosch – South Africa’s wine heaven! Cities on the Croatian Coast – Zadar, Split, Sukošan! Interesting stuff! I drove a VW van down the Pan American Highway in th 70’s. 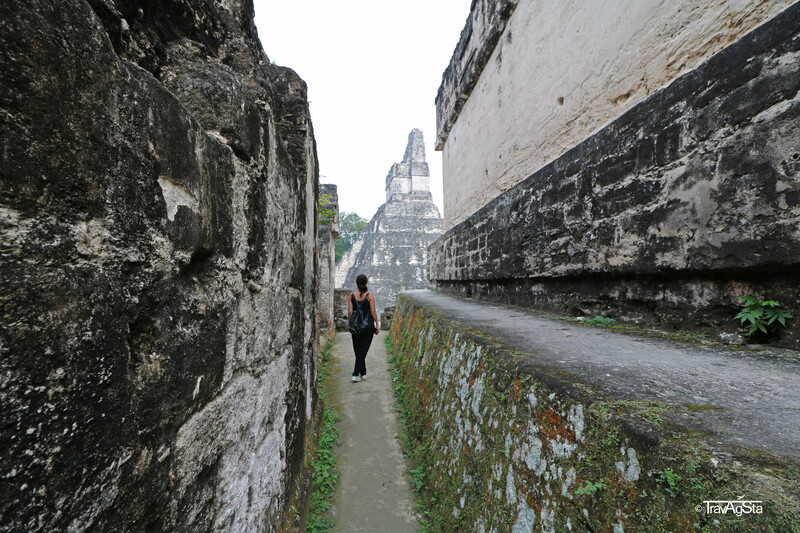 Loved Tikal. Yes, amazing region! Must have been great to drive the Pan American Highway!